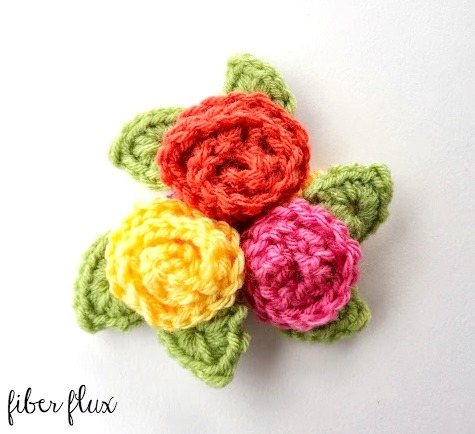 Here are some sweet little roses you can crochet in just a few minutes. They look cute sewn on just about everything, perhaps a whole garden of them is in order! Next, work 3 dc in each chain all the way across. It will begin to curl up immediately, and by the time you get to the end, it will look like a rose. You can use these same instructions to make a curlicue at this point, all you have to do is weave the ends. However for a rose, you'll keep it coiled up as shown and stitch it together. After that, thread the other tail with the tapestry needle and run it through the middle to secure. And then maybe a few around to hold it together a bit more. I have found that if I don't put enough stitches in, it tends to be a bit floppy. However, if you over stitch it, I have found that it flattens out and looses a lot of its dimension. A couple of well placed stitches are all you need. To finish it off, tie off the back and weave in the ends. Lovely! This one was about an inch and a half wide. Experiment with different yarn and hook sizes for a variety of different blooms. These roses look nicer and more realistic (as far as yarn can) than any other pattern I have previously seen. I look forward to making several sets of these to use on a wreath and possibly a corsage. Your roses are beautiful and your tutorial so simple to follow! Many thanks! These are so fun to make, thx so much! Great way to use of bits and bites of yarn, too. These roses look so easy when you do them. Very anxious to try. The tutorial is very well done and easy to follow. Thank you. Thanks for sharing the roses pattern, the tutorial is well presented and much appreciated. Once again thank-you. These roses make lovely gifts.